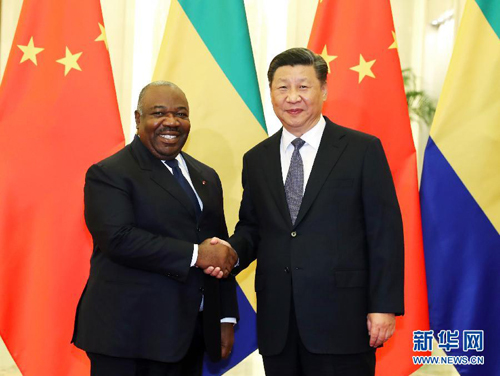 BEIJING, Sept. 1,Chinese President Xi Jinping on Saturday met with Gabonese President Ali Bongo Ondimba ahead of the 2018 Beijing Summit of the Forum on China-Africa Cooperation. Xi said the relations of China and Gabon have developed rapidly since the two sides decided to upgrade bilateral relations into a comprehensive cooperative partnership during a China visit by Bongo in 2016. China is satisfied with the current relations and is confident about the prospects of cooperation between the two sides, Xi said. He said China and Gabon should expand exchanges between governments, political parties, and parliaments, and step up efforts to share experiences in state governance. China firmly supports Gabon's independent development path and opposes external interference, Xi said. China welcomes Gabon to vigorously participate in the Belt and Road Initiative, Xi said, adding that he hopes the two countries will strengthen cooperation in areas including infrastructure, energy and minerals, and agriculture, and work to facilitate early realization of the goals of "Gabon Emergent" strategic plan. Bongo said the two countries have a long history of friendship that has taken root in people's hearts. Gabon firmly supports China on issues of major concern and is grateful to China for helping it accelerate the process of industrialization and modernization, Bongo said. Gabon is willing to vigorously participate in the Belt and Road Initiative proposed by Xi as it offers new, significant opportunities to achieve connectivity in Africa, Bongo said, vowing to expand cooperation with China in fields such as infrastructure, health, and human resources.